Amid reports of an exit, Chelsea and Belgium forward Eden Hazard has once again hinted at his desire to move to La Liga giants Real Madrid. The Belgium international has been constantly linked with a move to the Bernabeu in recent months, with the 28-year-old having openly vocalized his love for the Spanish outfit. Last year, the Chelsea star had said, "Real Madrid is the best club in the world. I don't want to lie, it is my dream since I was a kid." He also added that he didn't want to talk about his future all the time. "In my head, sometimes I wake up in the morning and think I want to go. Sometimes I think I want to stay. It is a hard decision. It is my future," he asserted. Despite his previous inconsistencies, Hazard is in great form under Maurizio Sarri at the moment, having scored 10 goals and registered 10 assists for the Blues so far this season. 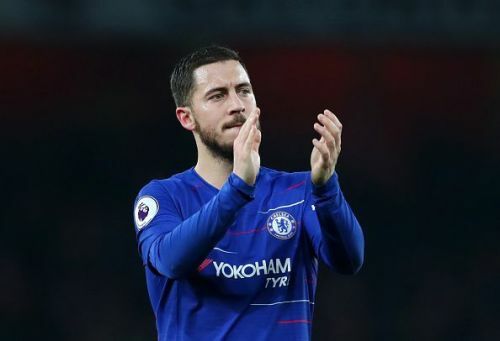 Hazard has done nothing to dispel the rumors around his move so far, but a fresh interview with France Football revealed that there are a number of things that might make him stay at Stamford Bridge. "Why not? You know it very well. You’re asking the question, but you know what the answer will be so you don’t have to ask it... I’ve won everything in England, apart from the Community Shield, but that doesn’t mean I’m leaving. I’ve always said that I wanted to explore something different after England but there are also things that might make me stay... After the World Cup, I wanted to leave, but in the end I stayed at Chelsea and I’m playing one of the best seasons so far." Hazard's contract runs until the summer of 2020, so it remains to be seen whether he will sign a contract extension with Chelsea or if he will make one of his "dreams" come true and move to Real Madrid.